Miami Intl Airport Take the Coral Gables exit as you leave the airport. Exit right on Le Jeune Road. Take 836 East to I-95 South to HWY 1. Turn left at 27th Avenue. Go to Bayshore Drive and turn left. The hotel is 2 blocks down on the left. From I-95 - Take I-95 South all the way to the last exit which is US 1 South. Go to 27th Ave. make a left, go to South Bayshore Drive make a left. The hotel is located 1 block down on the left hand side. From Florida Turnpike - Take the Florida Turnpike South to Golden Glades interchange. Take I-95 South all the way down to the last exit which is US 1 South. Go to 27th Ave. and make a left, go to South Bayshore Drive make a left. The hotel is located 1 block down on the left hand side. From 826/Palmetto Expressway - Take 826 to Bird Road, go east to 27th Ave and make a right, go to South Bayshore Drive and make a left. The hotel is located 1 block on the left hand side. From Florida Keys - Take Turnpike North, then 874 (Don Shula) to Bird Road. Right on Bird to right on 27th Ave., left on Bayshore Dr. The hotel is located 1 block on the left hand side. From Florida Gulf Coast - Take US 41 (Tamiami Trail) East to Brickell Ave right on Brickell to US 1 to 27th Ave. To Bayshore Dr. Left on Bayshore and hotel is 1 block up on your left. Distance from Doubletree Hotel Coconut Grove: 7 mi. Directions: Take 42av(Lejune Rd)south to 40 st sw. Make left until 27av. Make right at 27av until you get to bayshore drive. Make left, and the hotel is located a block away on the left side. 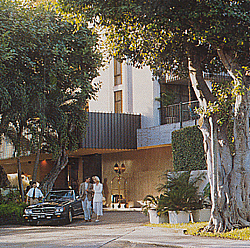 All 192 Doubletree Hotel Coconut Grove guest rooms and suites, many with balconies overlooking the bay or the city, feature attractive decor in a comfortable ambience. 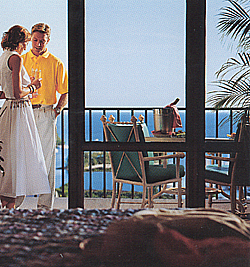 Our suites offer king-size sleeping rooms and large living areas. Feel free to unwind with a selection from our in-room movies. 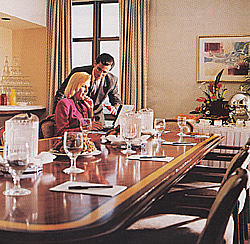 Incomparable service is the hallmark of Doubletree. Room service, dry cleaning and laundry services, valet parking, concierge, and bellstaff are available for your comfort and convenience. At Doubletree, when it comes to your personalized service, you'll find nothing is overlooked, only looked after with meticulous care and style. Enjoy indoor or outdoor dining at the charming Cafe Brasserie, serving breakfast, lunch, and dinner. Retreat to the cozy Lobby Bar for a cocktail, or indulge in a refreshing tropical drink at our poolside Splash Bar. Relax with a plunge into our large heated pool or play a few sets on our tennis courts. For the active traveler, there's jogging, biking, and strolling in the beautiful Bayside parks, all close by. Water enthusiasts can enjoy sailing and power boating at the bayside marina, just a short walk away.